Botswana is a land with a generally flat landscape, but which is so diverse in topology, it offers visitors a range of experiences from the Kalahari and Makgadikgadi to the Okavango Delta and Chobe River. The information provided below is for visitors who want to know a bit more about the place before they get there. It is vital travel information for the self-driver and fly-in tourists alike. 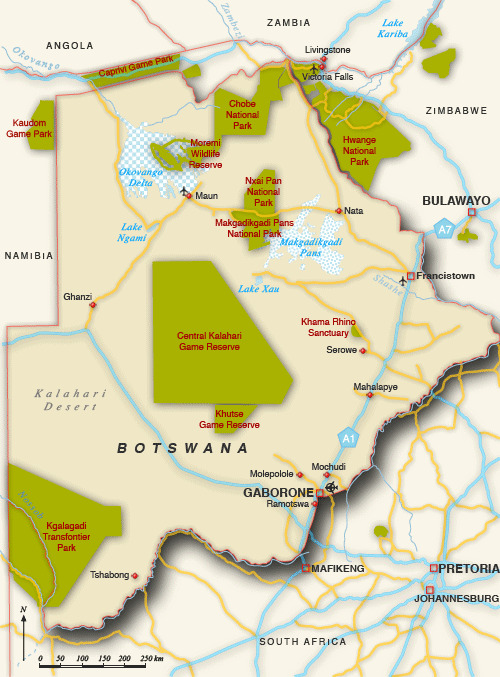 Below is a basic map of Botswana's territory. You can see the boundaries with the surrounding countries of Namibia, Zambia, South Africa and Zimbabwe. 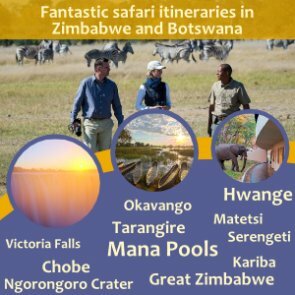 You can also see the different national parks in Botswana, the different towns and cities, the locations of the Kalahari Desert and Okavango Delta. Below is the Chobe National Park section of our Google Map. It shows the boundary of Chobe National Park, accommodation and places of interest in the area. Next is the Okavango Delta section of our Google Map. It shows the expanse of the Moremi Game Reserve, airstrips and accommodation in the delta. The power supply in Botswana, as with countries in southern Africa, is 220/240V AC/60 Hz. Both round (Type M) and square (Type G) three pin wall sockets are used, so you should travel with both adaptors. There are three mobile phone companies from which you can purchase a sim card to use with your mobile phone. You will also be able to roam using your mobile phone, although this may be quite costly. There are areas within Botswana that you will struggle to get cell phone reception if any at all (especially when you go on safari), but in most cases, lodges will have a satellite phone or landline. The international dialling code for Botswana is +267 (or 00267). Internet cafe's are available in the larger centres, although mobile phone users typically just use their mobile phones to access the internet. Botswana's currency is the Pula (see the foreign exchange rates here). Barclays Bank Botswana, Standard Chartered Bank and First National Bank are the local commercial banks. You will also find a few currency exchange bureau's in the major centres and border towns. Not all of Botswana uses credit card facilities but Visa and MasterCard are the most widely accepted with American Express and Diners Club cards being used in some places. Large supermarkets, fuel stations, hotels and travel agents, for example will most likely take credit cards. ATMs are available in most towns and will dispense Pula and not international currencies. You are welcome to bring any amount of cash in Pounds sterling, US dollars, Euros, South African rand, as long as you declare it at your point of entry. Most camps and lodges will accept these major currencies, as well as credit cards (Visa, MasterCard). All visitors to Botswana are required to have a valid passport. Visitors to Botswana are allowed to stay for a maximum of 90 days per year. There are different visa regulations for nationals of different countries, so be sure to understand whether or not you will need to obtain a visa prior to travelling to Botswana, or if you can get a visitor's visa on your arrival. See our Botswana visa page for more information. Children under the age of 18 are required to have additional documents with them. 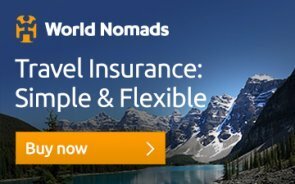 See more about Botswana travel requirements for minors. Botswana requires visitors who have been to high risk yellow-fever countries to provide a vaccination certificate upon entry into the country. If you do not live or have not visited a yellow fever zone, you do NOT need to produce a yellow fever certificate. For more information about countries that are considered high-risk areas, please visit our Yellow Fever page. The type of food in Botswana is diverse. Depending on where you visit, you can find local traditional dishes, a mixture of other foods that are typically found in Southern Africa (i.e., South Africa Zimbabwe, Namibia, Zambia, parts of Mozambique, etc. ), and international cuisine (Portuguese, Asian, German, Brazilian, Indian, Italian, Greek, Lebanese, Thai, Chinese, Japanese, Middle Eastern, Pakistani, etc). You will also find fast food places, steakhouses, pizza places, and the popular franchises such as Nandos, Mug & Bean and News Cafe. Safari lodges in the Botswana wilderness will typically provide all meals for guests, including those taken during excursions. Due to strict control of the foot and mouth disease, Botswana does not allow visitors to bring dairy or meat products into the country - these can be bought once you have entered Botswana. Tap water is generally safe for drinking, but we advise buying mineral water especially when you self drive or when going into remote areas. It does get hot and dry in some areas, so you must have enough water with you when you travel. Lodges, hotels, camps and supermarkets generally have a supply of mineral water bottles. Tipping is welcomed, although is not compulsory and should be done at your own discretion in-line with the level of service you feel as though you have received. The usual is 10%. Botswana does not carry any major health risks except for Malaria. It is highly recommended to take the necessary precautions to prevent contracting this disease. Northern Botswana has a higher malaria risk than the southern region. There are numerous primary healthcare facilities throughout the country. Botswana is not considered a yellow-fever risk area. For information about which countries are considered high-risk yellow fever areas, visit our page. Always stay hydrated and use sun protection such as wide hats, sun screen, sun glasses and long sleeved light shirts. The Botswana sun tends to get hot and can be dangerous. Enjoy the booze cruises, but remember to rehydrate. Botswana does have a high HIV infection rate, and although this may not affect visitors, it is important to know and make sensible decisions. Botswana is generally a very peaceful and safe country. However, visitors must be sensible and take at least the basic safety precautions such as locking car and hotel doors. Leave valuables only in safes or take them with you. Secure your belongings when in crowded places and when coming out of banks for example. Avoid being in dubious looking places and walking alone at night. See more camping safety tips listed in the next section. • Type of Vehicle to use: We generally recommend a type of 4x4 when driving through Botswana's parks. • Supplies: There are no places to stock up on supplies within National Parks. You will need to carry enough water, fuel, food and spare wheels - at least 20 litres of water per person; at least 100 litres of fuel in metal jerry tins. • Safety: If you can, travel in a convoy of at least 2 vehicles. National Parks are not fenced so you must bare in mind and take necessary precautions to ensure your safety. Always camp in designated areas. • Do not swim in lagoons or streams - there are hippos and crocodiles in that reside in such places. • Do not bathe or swim in still bodies of water - however, designated swimming pools, such as those at lodges, camps and hotels, are generally safe. • Bury and burn all rubbish and waste matter. • Do not sleep on animal paths or bridges. Do not sleep with your feet or hands protruding from your tent. • Extinguish all fires and cover them with sand. Make sure cigarettes are extinguished and place in a fire or empty bottle or can. Use the rubbish bins at the campsites or carry the rubbish with you to dispose of in designated waste containers. • Children - Never leave your children alone or let them wander by themselves. Never let them sleep or nap out in the open or on the ground. 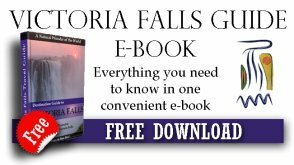 • Do not stray from the campsite or take walks without a qualified guide. Avoid walking at night. It is better to drive to ablution facilities within the campsite. • Observe the park gate opening hours. Between March and September, parks are open from 6am to 6pm, and between October and February from 5:30am to 7:30pm. • Park fees are charged per day. • Do not use noisy electrical equipment, radios or generators. Loud music is not allowed within the national parks. • Animals - Do not tease or feed wild animals. Domestic animals are not permitted in the parks. • Do not drive off the roads, and night driving is not permitted in the parks. • Boats - Using personal boats is not allowed in the parks. • Do not remove any living or other objects from the park. • Firewood - It is prohibited to pick up wood for fire in the park. • Hunting and possession of arms and ammunition is strictly prohibited.